"Twelve-tone Row for Lutoslawski", video installation, HD video with sound, 2:40 min., Twelve objects - acrylic on canvas on wood. Bartosz Sikorskis multimedia installation Twelve-tone Row for Lutoslawski/Zwölftonreihe für Lutoslawski is the first of its kind in the artists oeuvre. It consists of a 2:40 minute HD video projection with sound and twelve objects of varying shape which are composed of acrylic paint on canvas on wooden girders. The work is dedicated to the late polish composer and conductor Witold Lutoslawski who would have celebrated his 100th birthday in 2013. In the course of the video the twelve semitones of a full C major octave sound, which form an ascending chromatic scale. The twelve-tone row created by this constitutes the main element of Arnold Schönbergs twelve-tone music (although it is important to note, that Lutoslawskis twelve-tone technique differs from Schönbergs). The sounds originate from a pianino equipped with an internal microphone which also allowed implementing the noises that result from using said instrument (for example, at the very beginning of the piece the sound of pedalling is heard. 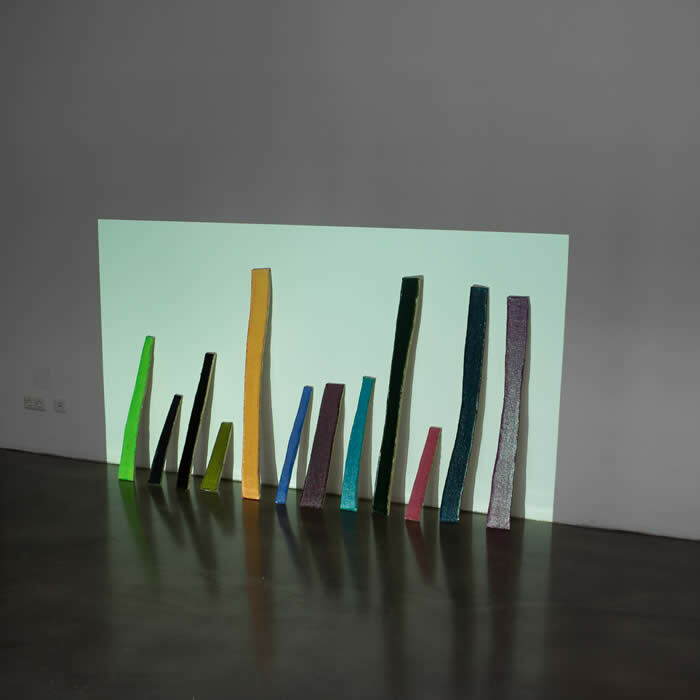 In the video twelve different shapes appear consecutively, which approximately coincide in color and shape with the wood-canvas-objects (which are skewed onto the projected area). While the shapes move from the left to the right, in time one notices that a note sounds as soon as the projected shape is congruent with its material counterpart. A note plays until a new shape coincides with its respective equivalent. As the shapes run their course over the other objects, the colors visually mix, those mixed colors playing an important part in Sikorskis ouvre. At the end of the presentation, shortly before the last shape arrives at the far right edge of the projected area, all tones sound once again in multiple octaves, but now in a descending cacophony devoid of system. The shapes, now visible in their complementary colors vibrate and sink with the tones downwards. After the objects have been crossfaded with their adjusting pieces in their former colors (but now simultaneously) the rest of the projected area turns black. Finally the objects are illuminated with white light, while the rest of the area remains dark. The assignment of projected shapes, respectively their counterparts in real space an the tones seems random or arbitrary, since the height of the wooden boards obviously does not coincide with the ascending scale. The same can be said about the choice of colors. Evidently the connection between shape, color and sounds is based on aleatory method or controlled coincidence. Lutoslawski also relied on such techniques when composing, which were inspired by the works of John Cage. In the case at hand Sikorski emerges as the supervisor of happenstance by defining the allocation arbitrarily yet leaving the possibility of changing this formation possible. Concerning the linking of color and sound the synaesthetic color organ by the russian composer Alexander Nikolajewitsch Skrjabin comes to mind. In the end Sikorskis work participates in the concept of Gesamtkunstwerk ("universal artwork") which unites sounds, colors and other materials. The proportion of the shapes appearing in the video and their real counterparts is interesting—in comparision they seem like ghosts, flat appearances of their three-dimensional correspondents. While the spectral phenomena appear in sequence all shapes are always visible through the objects in front of the wall and keep the earlier decisions concerning the attribution and the succession of notes present, they refer to a provisional system (which is however foiled by the extemporaneous cacophony at the end). The gradual appearances of the individual shapes, the ascending scale, the descending dissonance following the climax, as well as the darkening of the projected surface and the white illumination of the objects at the end intensify the impression of a play, in which flat surfaces of the bodies of actors are dissoluted to connect with the sounds in a way the viewer is able to follow.